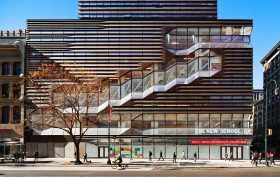 The first building of Cornell Tech’s Roosevelt Island campus officially opened on Wednesday, set to be the first net-zero university building in New York City. 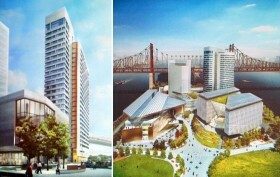 Known as the Emma and Georgina Bloomberg Center, named after former Mayor Michael Bloomberg who donated $100 million for the project, the four-story 160,000-square foot academic building will be the intellectual nerve center of Cornell Tech. Designed by Morphosis Architects, the building has a photovoltaic canopy and an aluminum-paneled facade. Historically, college dorms have been characterized by anything but great architecture. While many older institutions rent out rooms (“cells” may be a more apt description) in neo-gothic structures, newer institutions tend to house students in some of the world’s least inspiring modernist buildings (for an example, head over to the I.M. Pei towers that dominate NYU’s University Village). More recently, however, at least some colleges and universities have begun to acknowledge that where students live may have an impact on their performance. Financially savvy institutions have also started to link student housing options to student retention rates. 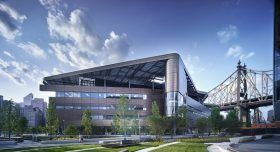 As a result, on many campuses, drab gray concrete structures with prison-size windows are finally giving way to light, glass and wood and to an entirely new range of built-in amenities. This means that whether or not all students know it, a growing number of them are now living in buildings on the cutting edge of contemporary design.